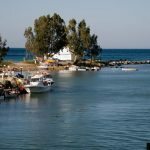 Heading away from Chania towards the town of Rethymnon you will encounter upon the picturesque small fishing village of Georgioupolis. What makes this small village so popular with visitors is the very long sandy beach which stretches through the small village. 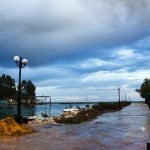 The village of Georgioupolis has started to become more popular with tourists over the past 15 years, and the town is now a bit more bustling with hotels, cafes and bars on the beachfront. 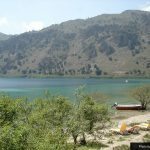 The sweet water lake of Kournas just 5km has a river that runs right through this picturesque village and the place is covered with old eucalyptus breeze which you can with the faint scent of Eucalyptus wafting through the village. 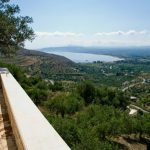 As mentioned above the village of Georgioupolis is quite small, and a very charming place to enjoy your holidays. 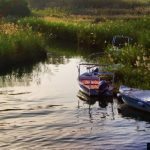 There are 3 rivers that run into the village, the largest of which is called Almiros, this forms a large delta and natural harbour for the fishing boats of Georgioupolis. The beach of Georgioupolis is the long and sandy and runs for almost 9 km, so you have plenty of space to find a quiet spot on the beach and enjoy the crystal clear waters. Most of the beach is covered by beach bars and smaller Tavernas so you will always have somewhere to enjoy a drink or snack. We have covered the main bars and tavernas in our directory below so if you want to know more just scroll to the bottom of the page. Just like many other resorts in the area you can catch a boat trip and explore the rugged and wonderful coastline. Some resorts you can visit via boat are Chania, Balos, Platanias and Rethymnon. 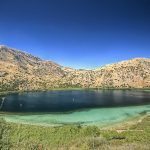 If excursions are more your thing then check out some of the local travel agents or speak to your holiday rep and you will be able to visit the magical lake of Kournas and enjoy a day out there with the family. There are plenty of waterfalls around Lake Kournas and Georgioupolis within walking distance and these can make for some great holiday snaps. 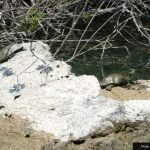 If you want to be a bit more adventurous then why not try joining the Jeep safari or horse riding in the area for an interesting day exploring the landscape of Crete. 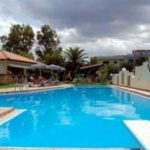 If your looking for some good bars and restaurants in Georgioupolis then try Titos bar which is open during the day for coffee, drinks and snacks but also a hive of activity at night staying open well into the early hours. There are a few more bars in the square which you must explore as mentioned earlier. 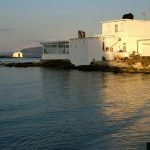 For eating there are a number of good Tavernas serving up excellent fish dishes and local Cretan cuisine and again you will find most of them on the beachfront or square. 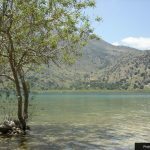 The lake of Kournas is one of only two lakes in Crete, the second is near Ierapetra. The lake used to be called ‘Korisia’ after ancient ‘Korion’, a city thought to be in the area with a temple to Athena. Strangely enough the lake is home to terrapins, local freshwater fish, wild goldfish and crabs, although once it was full of Sargasso eels. The lake receives thousands of visitors every year and you can hire pedalo’s from the shore or take a relaxing boat ride around the lake. 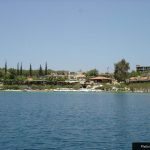 If your looking for something to eat in this area then the lakeside is well served with cafes and small Tavernas.